Johannes Vermeer (1632-1675) is one of the most representative painters of the Golden Age painting in Holland. He was a master on creating and restoring light on his pictures. He gave a different perspective to each picture by using the camara oscura and he treated carefully the colours creating a certain harmony between them. In all of his paintings one can feel the silent of the characters in one or another moment of their lives. He was interested in all the layers of society, from a merely milkmaid to a wealthy bourgeois gentleman. Hence, his art works reveal precisely what was going on in the society at that time. He is the great master on representing interior spaces where the light reaches an unequalled fineness. The Girl with a Wine Glass is the painting I am going to analyze in this paper. This picture was painted between 1659 and 1660 and today it is part of the art collection of Herzog Anton Ulrich-Museum, in Brunswick. As many of Vermeer’s paintings, it is set in a closed room with only one window that provides the light to the room. Vermeer, as the master of using light, he places the window strategically so that the light from the outside penetrates in the room and draws a diagonal line that crosses the picture from one side to the other. There is another painting on Vermeer’s collection that keeps a great resemblance with The Girl with a Wine Glass. This painting is The Glass of Wine. Unlike The Girl with a Wine Glass, it has two people in the painting; they are presumably a patron and a maid who is drinking a glass of wine. Both paintings are set in a very similar, almost identical setting, a room with only one window on the left wall and a picture on the rear wall. However, the distribution of the furniture is a bit different, though they both depict a very rural and familiar ambience. 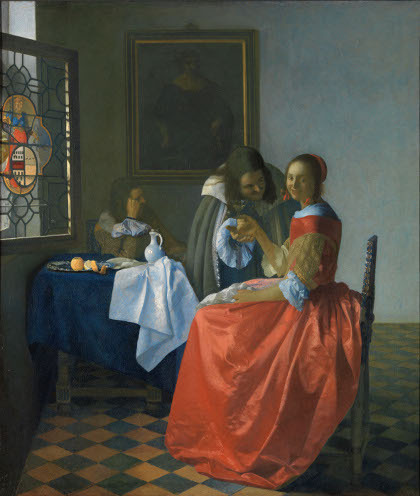 Vermeer in his earlier works used to direct the viewer’s gaze towards the area where the main figures are located, as for instance, Woman in Blue Reading a Letter. In these later paintings, the figures occupy a more open and deeper space and they are not located on the left of the picture, whereas in the middle or towards the right hand side. The variation on the light’s composition enabled Vermeer to move its figures around, remaining as illuminated as those standing beside the left window. In The Girl with a Wine Glass, we observe a completely illuminated room thanks to the light penetrating from the window, whose figures stand in the middle. In this case, the light is equally divided in the surface of the painting. Any character seems to stand out more than another; there are the character’s gestures or the facial expressions which seem to gain importance and they seem to express what the characters are thinking at that precise moment. The window on the left is the only source of light for the picture and it stands half-opened illuminating an image that dominates the picture. The light draws a parallel line that starts in the window and opens up across the picture until the opposite side. The two diagonal lines of light enclose inside the two main figures, the girl holding the wine glass and the patron. The person by the window is regarded to a secondary position with nearly no light. Starting the analysis from the left hand side, it is important to point out the half-opened window which has a stained glass very familiar in Vermeer’s other paintings. If we take a look at this detail of the glass, we can notice that the figure depicted is a woman holding a balance and a bridle probably personifying Temperance. The level symbolized good deeds and the bridle emotional control. The depiction of Temperance in the stained glass is in contrast with the figures of this picture. Temperance symbolizes moderation and this is precisely what the two main characters of the picture are not doing, the Patron and the Girl holding the cup of wine. The girl’s smile and the man’s attitude indicate that we are witnessing a scene of seduction, and that the girl is largely accepting her admirer’s advances. This attitude can be compared to the one in The Glass of Wine, where the patron is standing beside her but simply admiring how the girl drinks the cup of wine. As for the girl, she is sitting on a chair concentrated on the cup. She is at the moment of drinking and as she has half her face covered with the cloth on her hair and the glass, the viewer cannot appreciate any gesture on her face that could indicate what she is thinking or feeling at that precise moment. On the other hand, The Girl with a Wine Glass represents more vividly the characters and their possible thoughts. The couple is depicted closely to each other and the patron is slightly leant forward staring at the girl with a rogue smile and offering her the glass of wine. As this scene represents an act of seduction, we could consider the glass of wine as the prohibit fruit, as the apple that drove Adam and Eve to temptation and the consequent expel from the Garden of Eden. The only difference here is that the girl knows that the glass of wine is a sign of temptation and she seems willingly to accept it. The rogue smile of the girl might indicate that in here, it is much more the patron who is being seduced rather than the girl. She is showing a smiling face. Thus, rather than feeling obliged to sleep with the patron it is likely that she has been waiting for this moment for a long time now. Courtship and amorous relations is common in the Netherlands in the 17th century. People like patrons were wealthy people that sponsored the poor families. Women, as maids, had no individual power unless they were married. The scene depicted in this painting clearly represents an act of courtship in which the girl clearly does not put any barrier between her and the patron. He sees in this young girl beauty and innocence and he tries to seduce her. As said before, the glass of wine may represent the tempting object which makes the girl be taken in. The patron is a gentleman that tries to court the lady with objects and things that maybe out of her reach in her normal life. “At one time or another she will be mine. Look at her; she is the most beautiful girl that I have ever seen. But, how can I seduce her? I have to lure her in such a way that she does not sense offended”. As he enters the room, he sees a jug of wine on the table and he thinks: “A Glass of Wine. That would be the perfect excuse to seduce this beautiful lady. I will offer her a glass of wine. She will not be able to reject it since wine is one of the pleasures she is deprived of in her life”. He knew that he was extremely influential on the society and just by moving one of his fingers, he could have anything he desired. He could have all the women he wanted, even if they did not want to be with him. He provided them of all the things the maids had not access to. He knew how to lure them; he offered a life among luxuries, a very attractive life far beyond their limitations as maids. Whenever a beautiful young girl crossed his path, he started all over again the same trick. All the times, the girls were taken in, either willingly or unwillingly. But this time, something strange could be felt in the ambience. “Of all the girls I have been with, this has something special but at the same time if can feel something strange on her way of looking at me. Should I seduce her, as the rest of the girls I have been with, or should I look carefully all her movements?” – he thought to himself. The sight and the smile of the lady made the patron question every movement and gesture the girl made. “You are the most beautiful girl I have ever seen” – the patron said to the girl – “Please, take this wine glass as a present and as the beginning of a lifetime together”. All these lines were part of the script of the patron’s lifestyle. He used them with every girl and they help him seduce the females. They seem to have something enchanted, like a magic spell that made the seduced girl feel like a princess in a fairy tale. If we draw our attention to the female figure in the picture, we notice that her face reflects an unusual joy that seems to indicate that she is happy rather than sad of being seduced by the patron. The majority of the girls were forced to sleep with the patrons, but this young lady sees in this act of seduction a way of escape from her actual life. In this painting, it is interesting how the figure of the woman is depicted not only because of the attitude she adopts while seating on the chair, but also by the attitude in which we see her. In many of Vermeer’s paintings, women seem to be concentrated on their labour, sometimes carefully touching the objects and intending to do their everyday duties as well as possible. This is the case of The Milkmaid, The Lacemaker or Woman Holding a Balance, among others. None of them looks up and the girl in The Girl with a Wine Glass seems to look at the viewer in the eyes. With her sight she intends to express what she is achieving. In a way she wants to make the audience envious of her actual position. “Look at me, yesterday I was a current maid working for this rich family and now, I am walking towards the paradise. I will never serve as a maid anymore. I have trapped the patron with my beauty and lovely words. He thinks that I am going to be just one more in his list of seductions, but I will be more than that. I have been waiting for a moment like this all my life, and it was time to come. I will not be as many other maids who he has been with; I am different, and I will not oppose to anything he might propose. Many of the previous girls have been forced to sleep with him and then, nothing, they have been left working in the same house as they were before. He has treated them as mere objects. This time, it will be very different. I will make the patron see that I am truly in love with him and when least expected I will put him to public shame. I know it is a dangerous plan but little by little I will make him trust me and I will gain a certain status in society. I will be married to a wealthy man and so, I will have a voice and in a way respected or treated as a woman deserves. In the most unexpected moment, I will start up this plan of revenge. I am doing all this not only for myself, but also for all the girls abused by the patron. Although society is conscious of this situation, or at least they have heard about it, they do not dare to denounce it since they are afraid of the possible consequences.” The maid was organizing this plan to avenge the patron and his abusive attitude with women. She knows that she manages to marry him, she will have individual power. “Cheers!” said both the patron and the girl at the same time. If we draw the attention now to the rear part of the picture, we see that besides the couple, there is another person sitting in a chair. Comparing again The Girl with a Wine Glass and The Wine Glass, we appreciate that the latter has a chair on the first plain. This chair seems to be the same in The Girl with a Wine Glass, but it is where the mysterious man is sitting. As said before, the setting of both pictures is very similar; there are only differences in some furniture. The chair in The Glass of Wine is placed at the front since there is plenty of space. Without the chair there might seem to be an open space in the picture. This placing of elements in one place of another of the surface makes the picture gain different significances. If an object is set in the wrong place, the image may seem as overloaded, whereas if the painter places this object in another position, the painting will seem different. In the case of The Glass of Wine, the chair in the first plain helps to cover this empty space. Nonetheless, The Girl with a Glass of Wine, the chair is placed at the back since the table is showing some elements that would have been covered by the chair if it would have been placed there. Going back to the appearance of this mysterious man at the back, it is one of the very few openly negative figures in Vermeer’s works. His attitude reveals that he may be either a victim of love or simply drunk. This mood is reminiscent of that of the girl in another painting, A Maid Asleep. To conclude, Johannes Vermeer is regarded as one of the best painters of the Golden Age painting in Holland. He is a master in the creation of light and distribution of characters and elements in his paintings. The use of the camara oscura let him create different perspectives for his paintings. All the characters depicted in the paintings seem to reflect a different mood. The viewer can infer from their gestures, their position of their attitude what is that concerns them. It could be written one story from every person in every picture. In the case of the painting analysed in this essay, The Girl with a Wine Glass, the attitude of the two members of the couple is very revealing. The bending of the patron towards the maid represents an act of seduction and furthermore, the rogue smile of the girl represents that she is not going to oppose to any proposal of the patron. This couple, as many others in Vermeer’s paintings represent the society of his time, and looking at his paintings, the audience can get an overall idea of how the society of the seventeenth century was like. An interesting element about which I had addressed in a no-longer-used site, has to do with the ladies red caffa/damask gown painted with Terborchian attention to its splendid sheen. The part I would draw your attention to is that portion that rests upon the chair behind her. It is as though the lady lifted the skirt and dropped it behind her as she sat down. It seemed to me an entirely unlikely way to deal with the dress, as the smoothing and spreading of the garment under her is the only way to keep an unwrinkled (and lady-like)appearance! Was this done to accentuate her slightly drunken state in a visual way? Whatever the reason Vermeer chose this visual ploy, the spatial relationship of the straight back of the chair and her own straight back adds immensely to the narrative and the charm of the painting. The gather at the back in the dresses of similarly compromised young ladies in works by other artists of the genre can be found. Gerrit Dou shows a lady, alone, with wine imbibing as the theme of one of his paintings and she is identically compromised by her dress. The “Girl Interrupted at Her Music” adds another wrinkle to the question of the gather of skirt previously discussed (September 25). It may be the key to the interpretation, as the element in an otherwise innocent scene of serious music- making. It has occurred to me that the reason for the gather of the skirts at the chair-back in “The Glass of Wine” is hinted at in the “slump” of the drinking lady in “The Wineglass”. In order to raise themselves up (see also “lady Seated at the Virginals”) for activities such as learning to play the lute, and for comfort, a LARGE pillow was used on the rather low chairs. But with the complication of WINE and the natural tendency for the ladies to slide forward in the ample material of their skirts, the unusual, but practical solution of the, now, uninhibited lady, is to throw her skirts behind her to effect greater ‘friction’ in her perched position! In the “Girl Interrupted at Her Music”, it appears that the young woman has put down her stringed instrument and descended from her perch on one chair, but has dealt with the skirt, deftly, as she would have on the other chair, due to her slightly drunken state. This change of seats also discloses the gradual seduction taking place and to the one (the viewer) who has entered the room, and whom the girl acknowledges, the portion of her dress pushing through the space in the chair-back, the intemperate compromise is revealed. The beautiful vermillion gown of the other seduction scene is a more deft and stunning revelation as she straightens her back to hide a drunken stuper. http://www.essentialvermeer.com/catalogue/lady_seated_at_a_virginal.html See, particularly, the related works at the bottom of a list of interests on this site. Find, too, how interested the genre painters were in the joke of the skirts of the attractive and universally inebriated young ladies in seductive and lovesick scenes, who expectantly wait for gentlemen or paramours to arrive or are in the presence of a seducer. The skirts thrown behind inappropriately, but very practically in their circumstance of alcohol induced uninhibited laxity, show the effects of wine, whether or not apparent in the painting. The skirts and the bare shoulders of Steen’s virginals player indicate not only the degree of compromise, but that the lady was expecting the outcome from the outset. The servant boy with the lute is a final act of synchronicity before her awaited end is enjoyed. Molenaer’s Lady shows the same expectancy, as her cavalier enters, with the cocked hat and knowing expression of the boy betraying her shallow guise of propriety and, again, her skirts in disarray. The added heat of the footwarmer will make his work easier, when the children are dismissed. Not shown here, but DeHoogh especially, indicated, subtly, the disastrous effect these affairs would have upon more innocent children. Maids mothering kids set aside for interludes and the outside interests of the errant parent, and even given drink as an afternoon sleeping aid by a maid with her own expectations for a tryst while the mistress is absent! These are the warnings of painters to a society in danger of new and feared carnal activities as change came inevitably, that they approached with humour and, hopefully, real fear of consequences and desire to affect a bulwark and dike to the rising trends and tides. “Girl with a Wineglass” is likely the only work by Vermeer, having a painting-within-a-painting, which is NOT an adapted copy of a known work. If it IS an actual work, an alteration may be the large hat that the three-quarter figure holds with his gloves in his left hand. The projection of the crown of the hat, that is barely visible against the figure, is held over the loins and points at the seducing jonkers head in the foreground. Previously, I have identified, with sufficient proofs, the Astronomer and, therefore, the Geographer as Vermeer, himself. I had also stated that Ter Borch’s “the Dispatch” likely held an image of Vermeer (the messenger figure), as compared to the geographer. Note in the link below to the Dispatch the probable date of its execution (1658-59) and the positioning of the hat, held with it’s crown directed at the seated officer’s head like a cannon. Interestingly, this self-portrait was painted in 1668; the year during which Vermeer began painting his self-portraits. It is obvious that I think these related elements of the two painters significant. They convey to me a conversation in paint and a shared bawdy sense of humour and a mutual respect between two friends of a shared profession. Ter Borch was a much admired portraitist of his time and was known for his full-length portraits on a very small scale; a size in use in his genre works as well. The portrait within the work, above, by Vermeer, was shown as a full-sized three-quarter view on the back wall. It is interesting that it appears this large, due to the extended floor tiles on the right side, which deepens the room. If the last five to six rows of tiles were removed, the wall would be beside the seated soldier and the portrait figure would have been undersized and quite unlike any of the portraits of the day!